Someone recently mentioned to me that they make a chicken dish with grapefruit and ginger, and I was not impressed. I couldn’t really picture how the ginger would work with the fruit and the chicken, but when I tried my own version – recipe below – I was pleasantly surprised. 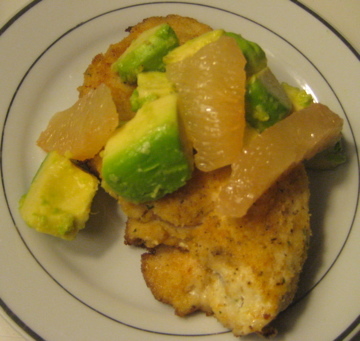 The ginger wakes up pan-fried chicken, the grapefruit tarts up the avocado, and the whole thing just…works. Plus, it’s not time-consuming but is filling enough that you don’t really need any side dishes. Melt butter over medium heat. Dredge chicken cutlets in milk and then breadcrumbs, then pan-fry over medium-low heat until cooked through (5-7 minutes). 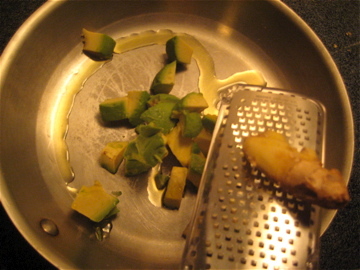 Put avocado, ginger, and reserved grapefruit juice in a pan, bring heat to medium for 1-2 minutes, add a pinch of salt. You don’t really want this to cook, you just want the flavors to meld. Top chicken with avocado mixture and grapefruit supremes. Voila. Interesting recipe. I’ve never heard of these combinations. My boyfriend doesn’t care for grapefruit very much — do you have a recommendation for a replacement? I bet an orange would be a fine substitute, with a spritz of lemon or lime for the sour element.